Today I would like to leave a message to all girls. For those who are planning hen party, birthday party, night out or trip to Krakow and for those who like to have a great fun and feel the kick of adrenaline! All of our activities are perfect for you! From our experience we can tell that sometimes you are tougher than some of the guys. If you just like to spend time in an active way and you don’t mind getting dirt on your hands you will find something interesting in our offer. Today I want to show you how girls were having fun on our Axe Throwing. This activity sounds crazy, and truly is but in a positive way. You will easily learn the technique how to throw, you don’t need to have lots of strength, you can even use two hands. The axe weights only 600g, so it’s like throwing a small bottle of water. You can do it without any problem, right? For me this is great activity because you don’t need to have a lot of training or skills, you just forget about the world and have pure fun. You can reduce the stress, feel the endorphins, and just laugh. We had lots of groups for hen party, some of the girls at the beginning didn’t look eager, but after few minutes they were having such a great time. To prove my words I attached few pictures, they will show you more than my arguments. 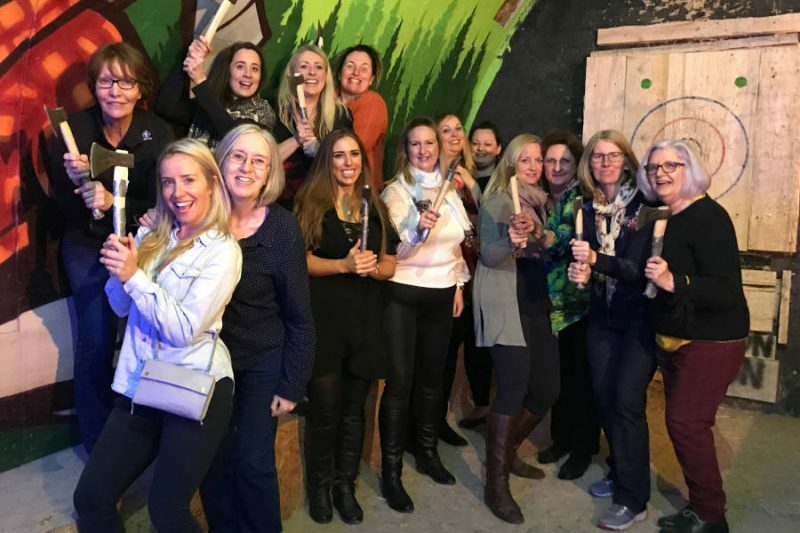 So if you are looking for some activities for your party don’t hesitate just pick Axe Throwing and for sure you will spend an awesome time with us!